Humans require food, water, and living space in order to survive. These things do not exist in endless abundance and are derived both from abiotic and biotic sources, making humans inherently dependent upon the optimization of land area and the preservation of biodiversity. The human population is increasing, and is predicted to expand from 7.0 billion to 9.6 billion people by 2050. A parallel increase in the demand for food species is implied, and estimates claim that food production will need to be doubled in order to compensate. The trouble with this becomes evident upon the consideration of the productivity of current systems of agriculture and freshwater harvesting: despite our efforts, 1.0 billion people suffer from hunger modernly, and 1.2 billion live in areas with water scarcity. To make matters worse, the affluence of the world is increasing, meaning that more of the future's consumers will demand higher—quality resources. The intensified harvesting of resources from the environment affects biodiversity negatively, as it contributes to climate change, through the burning of fossil fuels and habitat fragmentation, degradation, and reduction as natural terrestrial environments are converted into farmlands and housing. Deforestation is the leading cause of biodiversity loss, and today, about 38 percent of global land is devoted to agriculture. Without altering our current systems of development, this percentage will only increase, as open-air soil-reliant crops cannot be stacked into storied facilities. optimize space in current agricultural settings. It is true that other technologies exist in order to address these problems independently. More sustainable forms of irrigation, for example, reduce strains on freshwater habitats, but also allow for the development of arid regions with entirely different forms of biodiversity: modern agriculture occupies far more than the 10.6 percent of global land that is arable (FAO, 2011). 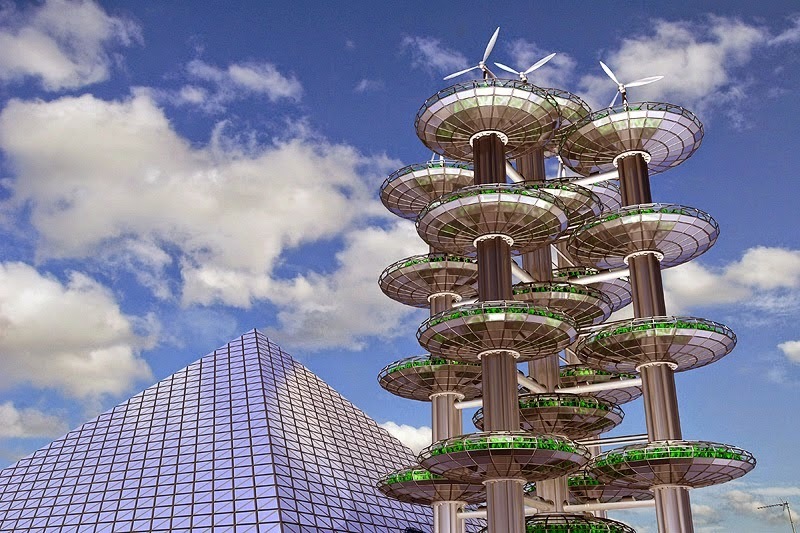 The above technologies are favored in this report because they seek to mitigate a broad array of anthropogenic environmental problems simultaneously. Traditional agriculture, in this report, refers to systems which are characterized by expansive plots of extensively-tilled land. In many countries, the crops of such systems are monocultures selectively bred for high fruit, grain, or biomass yields: agricultural development promotes biological uniformity in food species and in environments. Traditional systems use large quantities of fresh water (for the purpose of irrigation) and fossil fuels (to power machinery and for transportation purposes), with relatively marginal returns (Pfeiffer, 2003). In the United States, approximately 10 kilocalories of fossil fuel-derived energy are needed to produce 1 kilocalorie of food energy, agriculture accounts for 17 percent of total energy expenditures, and 13 percent of agricultural energy consumption is attributable to irrigation (Pfeiffer, 2003). What is more, it is believed that current energy expenditures must be increased in coming years in order to maintain current crop yields (Pfeiffer, 2003). In short, massive portions of the world's land area and substantial quantities of fresh water and fossil fuels are being devoted to the production of food which fails to meet humanity's basic dietary needs. The continuation of the current system of agriculture would mean the continuation of the degradation and destruction of the habitats of innumerable species, both aquatic and terrestrial, with insufficient returns. New procedures which limit the further development of habitats (and provide the opportunity for the reversion of already degraded farmlands) while still meeting humanity's food and freshwater needs are needed. Hydroponics is a system of agriculture that utilizes nutrient-laden water rather than soil for plant nourishment (Bridgewood, 2003). Because it does not require natural precipitation or fertile land in order to be effective, it presents people who are living in arid regions with a means to grow food for themselves and for profit. The re-use of nutrient water supplies makes process-induced eutrophication (excessive plant growth due to overabundant nutrients) and general pollution of land and water unlikely, since runoff in weather-independent facilities is not a concern. Aeroponic and hydroponic systems do not require pesticides, require less water and space than traditional agricultural systems, and may be stacked (if outfitted with led lighting) in order to limit space use (vertical farming) (Growing Power, 2011; Marginson, 2010). This makes them optimal for use in cities, where space is particularly limited and populations are high-self-sustaining city-based food systems mean a reduced strain on distant farms, the reduction of habitat intrusions, fewer food miles, and fewer carbon emissions. Typically, aeroponic and hydroponic systems have high energy costs because they incorporate lighting, pumping, and air moderation systems. Primary costs (aside from energy costs) include the purchase and purification of fertilizers and water. Between 20,000 and 25,000 hectares of land are currently under hydroponic development globally, supplying 6 to 8 billion dollars' worth of produce (HydroGarden, n.d.). Hydroponics, with its various forms of drip and flow style irrigation (Figures 1 and 2), limits the threat of water waste via over- or poorly-timed irrigation (water loss due to evaporation), and therefore limits freshwater habitat abuses. Pollination can be achieved via machinery: because the plants are grown in water, their root systems no longer function as supports-crops are held in place individually by hanging wires, which may be shaken in order to simulate air-based pollination or self-pollination with the assistance of bees, flies, or bats (Williams and Bolton 1991). This, of course, is not an ideal means of pollination, but allows for the growing of plants in enclosed areas and in the absence of natural pollinators. Crops can be grown in controlled environments with optimal "weather" conditions. The limitation of transpiration stresses means enhanced productivity (Sahara Forest Project, 2009). Productivity within a hydroponic facility is productivity that does not detract from the fertility of the soils of terrestrial habitats. Manipulated, expansive monocultures can be raised (in order to feed our immense population) without depleting soil or hindering the developments of less-biologically-engineered specimens of the base species. Crops can be grown in "stories" in order to maximize vertical space and minimize land occupation (see alternative: vertical farming) (Growing Power, 2011). The following is an extension of item II. The majority of mineralogical and subterranean resources have been depleted in unprotected areas, and stores in protected areas now represent the most cost-effective options in terms of fuel and materials refinement. The raising of algae crops can reduce future habitat degradation: using hydroponic systems, algae can be grown in vast quantities in order to supplement other green energy sources through the development of high-quality non-toxic, renewable, bio-degradable biofuels (Sahara Forest Project, 2009). Algae have a higher growth rate than terrestrial crops and an incredibly large per-unit-area yield (between 7 and 31 times as great as that of palm oil, a biofuel whose development involves the clearing of land, the degradation and destruction of habitats, in favor of the planting of palm monocultures) (Wagner, 2007). Some species are up to 40 percent lipids by dry mass (see Table 1), and can therefore generate 30 times more oil per acre than alternative biofuel crops (Wagner, 2007). Some species can be harvested every day (Wagner, 2007). Algae consume large amounts of carbon dioxide during development and, when grown in proximity to troublesome industrial settings, can mitigate contributions to atmospheric carbon; 61 percent of global greenhouse gas emissions come from energy-derived carbon dioxide (Sahara Forest Project 2009). They also produce oxygen through photosynthesis (Wagner, 2007). Joint power plant and greenhouse facilities already exist in a number of arid locales, serving as sources of fresh water for the purposes of irrigation and human consumption, as centers of food development, and as repositories for solar energy (Seawater Greenhouse Limited, 2010). The companion technologies interact in order to create a self-sustaining operation. The focusing of sunlight on heat collectors (using light-tracking reflectors) creates steam which turns a turbine to produce the electricity needed to operate the greenhouses; evaporated seawater cools and humidifies the air within the greenhouses; a portion of the evaporated seawater is distilled to form fresh water (for the irrigation of in-greenhouse and open-air crops, for drinking, and for the cleansing and thermal moderation of the plant); and the resultant crops feed humans and act as air filters, reducing power plant mirror deposits (Clery, 2011). About one million tons of seawater can be evaporated per day (in a 10,000 hectare facility) simply by taking advantage of cogeneration: while independent solar thermal power plants lose 75 percent of collected energy as waste heat, joint greenhouse and power plant facilities lose only about 15 percent of collected energy. The rest is devoted to the heating of water for the purposes of desalination (Seawater Greenhouse Limited 2010). Quantitatively, one terawatt-hour of power results in the desalination of about 40 million cubic meters of water (Seawater Greenhouse Limited, 2010). Sustained farming of high-value crops year-round in arid regions could reduce the strain on current food-producing locales, promote world health, and save freshwater habitats by limiting irrigation. Technological progress and cost reductions are necessary before seawater greenhouse systems can be realized as a suitable means of large-scale energy production. However, studies at pilot facilities are being conducted now (Sahara Forest Project, 2009). The fresh water produced via this system requires no chemical treatment. As a result, the possibility of process-induced pollution and eutrophication is eliminated (Seawater Greenhouse Limited, 2010). Seawater evaporation membranes coated with biocidal (organism-destroying) materials reduce the need for pesticides (which can threaten predator species through biological magnification) (Seawater Greenhouse Limited, 2010). The salt and minerals gained through the distillation of seawater can be used by local traditional farmers or sold for profit (Sundrop Farms, 2011). Arid and seemingly infertile lands are optimized, and 15 to 30 times more produce than in conventional agricultural systems can be raised per unit area (Sundrop Farms, 2011). Facility management and operation employs between 5 and 7 people per hectare of facility (Sundrop Farms, 2011). Biomass can be used for food, fodder, fuel, or fertilizer (Sahara Forest Project, 2009). The technology was piloted in 1992 at Tenerife of the Canary Islands; there, the degradation of habitats was the result of the depletion of groundwater stores (Seawater Greenhouse Limited, 2010). In 2000, a second facility was constructed on Al-Aryam Island, Abu Dhabi, United Arab Emirates (Seawater Greenhouse Limited, 2010). This greenhouse was noted for producing more fresh water than it required for irrigation (Seawater Greenhouse Limited, 2010). In 2004, a third, 1,000-square-meter facility was developed in Oman (Seawater Greenhouse Limited, 2010). 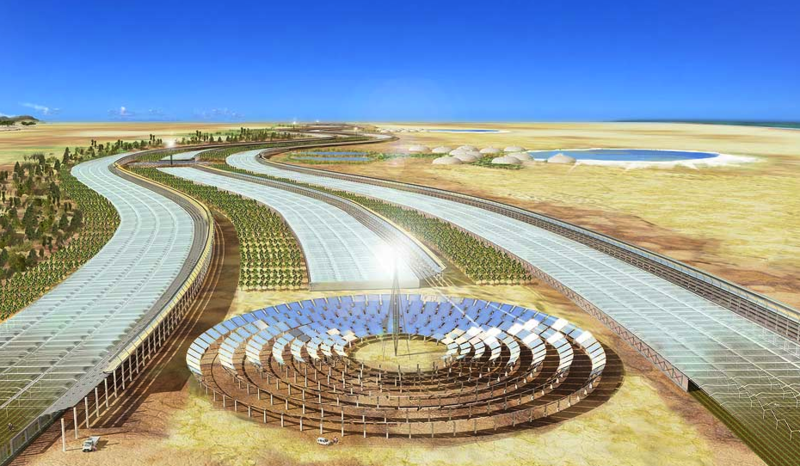 It is still in use, and utilizes relatively less electrical power than ordinary greenhouse and distillation systems to evaporate 5 tons of seawater daily: cooling and distillation processes are powered by the sun and wind, making the self-sustaining system optimal for use in remote locations (Sahara Forest Project, 2009). The first commercial facility was developed in Port Augusta, Australia, in 2009 (Cho, 2011). The cost of its construction was 2 million dollars (Cho 2011). The 2,000-square-meter facility has the potential to produce 100,000 kilograms of tomatoes annually, and was harvested for the first time in December of 2011 (Cho, 2011). Because evaporated water humidifies the air within and around the seawater greenhouses, crops can be grown traditionally in the surrounding, moistened environment (Sahara Forest Project, 2009). Australia: South Australia, Western Australia, Northern Territory, and Queensland. Figure 7: optimal locations for joint greenhouse and power plant facilities. Early development of hydroponic and seawater greenhouse processes would ideally be restricted to areas which demonstrate stable economics, heightened land degradation, a high density of species, and a human need for non-traditional, self-sustaining means of fresh water or food production. Areas below sea-level reduce energy inputs further, since water pumping is facilitated (Sahara Forest Project, 2009). Nation-by-nation consent or person-by-person donations would largely govern the spread of the technologies. A new subsection of the United Nations would manage the distribution of funds (gathered through the penalty of signed nations or businesses which trespass against its policies) to nations eager to implement the processes. Bridgewood, L. (2003). Hydroponics: Soilless gardening explained. Ramsbury, Marlborough, Wiltshire: The Crowood Press Limited. Brudvig, L. A., Damschen, E. I., Tewksbury, J. J., Haddad, N. M., & Levey, D. J. (2009). Landscape connectivity promotes plant biodiversity spillover into non-targent habitats. Proceedings of the National Academy of Sciences, 106(23), 9328. Charles, H., & Godfray, J. (2011). Food and biodiversity. Science, 333, 1231. Clery, D. (2011). Greenhouse—power plant hybrid set to make jordan's desert bloom. Science, 331, 136. Hydroponics: An introduction to soilless agriculture. Williams, J. and Bolton, D. (Directors). (1991). [Video/DVD] Athens, GA: American Association for Vocational Instructional Materials. Nicholls, R. E. (1990). Beginning hydroponics: Soilless gardening: A beginner's guide to growing vegetables, houseplants, flowers, and herbs without soil. Philadelphia, PA: Running Press. Resh, H. M. (1989). Hydroponic food production: A definitive guidebook for the advanced home gardener and the commercial hydroponic grower. Santa Barbara, CA: Woodbridge Press. Tucker, M. R. (1994). LaMotte soil handbook. Chestertown, MD: LaMotte Company.